When I visited Ireland the first time in the spring of 1986, the talk on the radio and on the streets was all about the divorce referendum. It didn’t pass that year, but narrowly prevailed 10 years later by 50.3 percent to 49.7 percent. When I was here last year, all the buzz was around the marriage equality referendum. I was part of the rejoicing when the “YES” vote succeeded 62.1 percent to 37.9 percent, making Ireland the first nation to do so by referendum rather than legislation. This year, the big concern is that Ireland is without a government because of an inconclusive election (the incumbent party got only 25.5 percent of the vote) and the inability of politicians, so far, to form a coalition. Sound familiar: elected officials having trouble finding agreeable solutions to problems? Parading in Dublin with images of Easter Rising patriots. Photo courtesy of Sr. Cathy Cahill. Of course, this year is also the centenary of the 1916 Easter Rising, when brave Irishmen and Irishwomen said “No More!” to English rule. I arrived a few weeks after the official commemoration on Easter Sunday. Imagine my delight when I happened upon the “Citizens’ Centenary Celebration” in front of the GPO on Sunday, 24 April, the actual 100th anniversary of the event that change Ireland forever. I was surprised at the tears that welled up as I listened to the speeches, the songs, and reading of the great proclamation. I wondered about my grandfather, who left County Roscommon in 1895 and settled in Providence, Rhode Island. What were his reactions when the news of the insurrection made its way across the Atlantic? I’m sure he was a nationalist sympathizer. When the names of the proclamation signers were read and I heard “Joseph Mary Plunkett,” I immediately thought of his poem, “I See His Blood Upon the Rose.” It’s been 60 years since Irish nuns in America had us memorize it! There also were songs about the women who took part in the Rising and then written out of history. There were songs bemoaning the divisions that still exist and songs celebrating the strides toward unity that have been made. 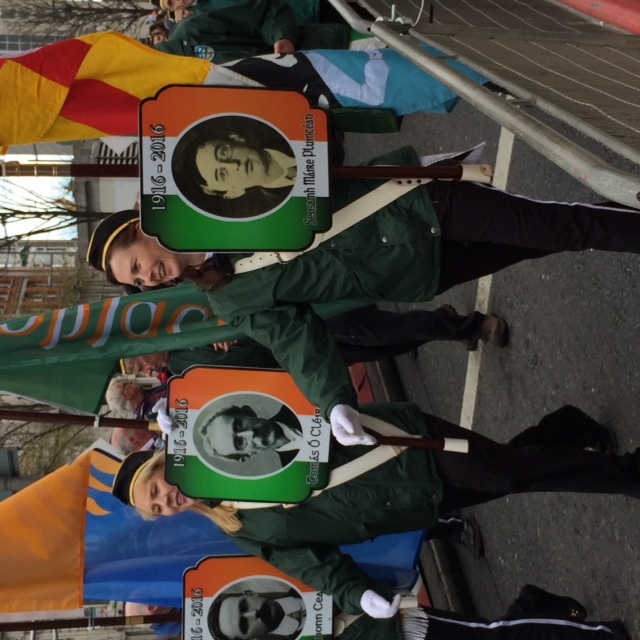 The variety of groups taking part in a parade reflected the needs of today’s Ireland. Labor unions, refugees, Travellers, homeless, and many others. As an Irish American, I am grateful to be here at this time. I pray for the day when striving for liberty and independence does not involve violence. This entry was posted in History, Irish America, Politics, Uncategorized and tagged County Roscommon, Joseph Mary Plunkett, Travellers on April 27, 2016 by admin.